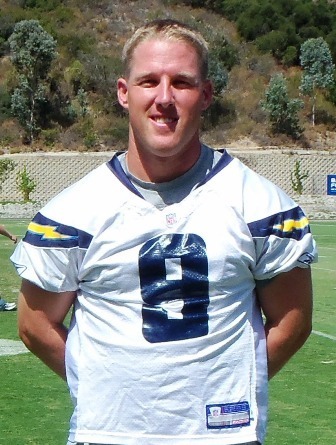 The Bolts have a new veteran kicker, as Tuesday the team inked Nick Novak to a two-year contract. Novak takes the spot of the injured Nate Kaeding. Kaeding tore a ligament in his left leg during the season’s opening kickoff, which Minnesota’s Percy Harvin returned 103 yards for a touchdown on Sunday. Kaeding was placed on injured reserve Tuesday, meaning he will miss the rest of the season. Novak, who was in training camp with the Chargers in 2010 and the New York Jets this season, has kicked in 22 NFL games, making 19 of 30 career field goal attempts (.633). He’s played with Washington, Arizona and Kansas City. The Chargers also signed defensive end Ogemdi Nwagbuoto a one-year deal after Luis Castillo broke his lower left leg on Sunday. Nwagbuo was waived by the Chargers on September 3rd. Nwagbuo played for the Chargers the last two seasons, appearing in 27 games with five starts. To make room for Nwagbuo, safety C.J. Wallace was released.